The annual flood of big-budget video games is upon us, Gameologinistas, but it isn’t some $60 open-world cinematic epic that’s got me hooked (though, I’ve thoroughly enjoyed my time with Assassin’s Creed Syndicate). No, I’ve become obsessed with a tiny $3 game, available on Steam and iOS, by the name of Downwell. Largely the work of a single developer, Ojiro “Moppin” Fumoto, it taps into the same tension, frenzy, and unpredictability that fuels games like Spelunky or The Binding Of Isaac. You play as a nondescript little dude who ventures down a well in search of treasure with only his gun-boots and seeming immunity to the damage falling hundreds of feet can do to a person upon landing. Besides being a highly customizable weapon, your gun-boots also function like a crummy jetpack, slowing your descent with each shot and allowing you some extra time to maneuver and assess the situation. But your ammo runs out quickly, and the only way to restock and regain control of your falls is to either land on solid ground or bounce off one of the well’s many monsters. Landing allows for a well-deserved moment of peace and reflection, but bopping enemies on the head without touching the ground is the only way to build up your combo meter, which grants health and other essential bonuses if it gets high enough. And that’s where the driving tension of Downwell comes from. After enough attempts, you’ll start to learn about the enemies and traps that fill each of the game’s themed areas, but the well’s hazards are laid out randomly at the start of each run, so there’s no way of knowing exactly what lies ahead as you plunge into the darkness. Firing your boots and controlling your descent to the point where you can actually plan a route on the fly is the key to survival, but it’s all too easy to find yourself out of ammo and plummeting into the unknown. You could always try to land and cash out your combo, but as dangerous as it is to zoom past solid ground and potentially toward ruin, the allure of seeing that little combo tally above your head tick up even higher is often powerful enough to assuage such fears. 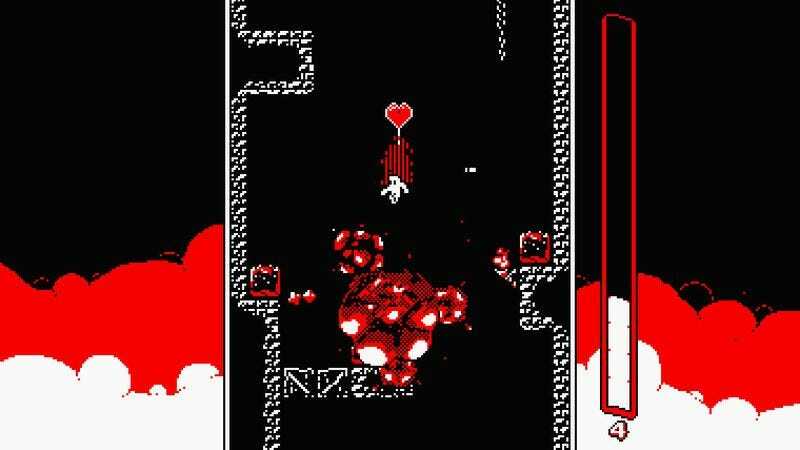 Once you’ve pieced its few simple components together, Downwell emerges as a nonstop struggle against gravity and greed. It offers a few respites—several powerful abilities to choose from at the end of each level, a merchant who sells health or upgrades for your ammo meter, the occasional side-room where time freezes and you can take a few seconds to breathe without sacrificing your combo—but as welcome as these are, their soothing effects are fleeting. You can hang out with that friendly merchant for as long as you want, but there’s no escaping the fact that the only way to go is down.